This entry was posted on May 14, 2013 by Jessica Anderson. Lately, I’ve been noticing that when I watch TV, at some point in the program there will be a trophy or several trophies in the scene. Usually it’s in the background. Sometimes is the subject of a conversation. Same goes for movies. Last weekend my husband and I were taking a walk through the neighborhood and saw an Open House, so we went in for a peak. Admit it, you do it too. In two of the rooms, there were shelves of trophies along with pictures documenting a child’s baseball career. Trophies are everywhere. It makes sense. If you earn an award, you want everyone to know about it. I know that I have my Chili Cook-Off 1st place trophy on my desk at work. And if I happen to get a phone call from a customer looking for Chili Cook-Off awards, I tell them they are talking to the right person. Businesses you frequent will proudly display awards they have earned so you know they are the best at what they do. Athletic teams display trophies and banners. My kids’ high school had an impressive trophy case dating back many years. Most cities ask their citizens to vote on ‘The Best of (insert city name here) Awards’ every year, then the winner’s names are printed in the local paper and awards are presented. Winning an award can pump up your salary. Think Heisman, Rookie of the Year, Oscar, or even Salesperson of the Year in your company. 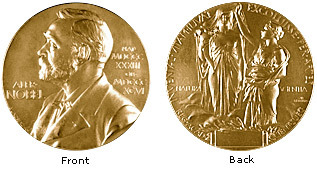 The Nobel Peace Prize includes a monetary prize, a diploma and a gold medal. Pulitzer Prizes are given for a range of achievements in journalism, writing (fiction, non-fiction and poetry) and music. The list of award opportunities is endless. The thing is, trophies represent something important. Accomplishment, success, winning, achievement are all words we associate with awards. Being the best at something, no matter if it’s the team MVP, a spelling bee finalist, Nobel Prize winner, or the top sales of the quarter, is a big deal. We all want recognition. We want to know that what we do matters. And when we receive recognition, we want others to know about it too. It makes us feel accomplished, connected, leaves a lasting impression and it makes us work even harder to earn more kudos. So here’s to your accomplishments. Here’s to your trophies and awards! If you’re proud of an award you’ve received, post a picture on www.Facebook.com/trophies2go.